I'm putting them on point! By adding some setting triangles and corner setting triangles the finished blocks are ready to turn into a pillow! 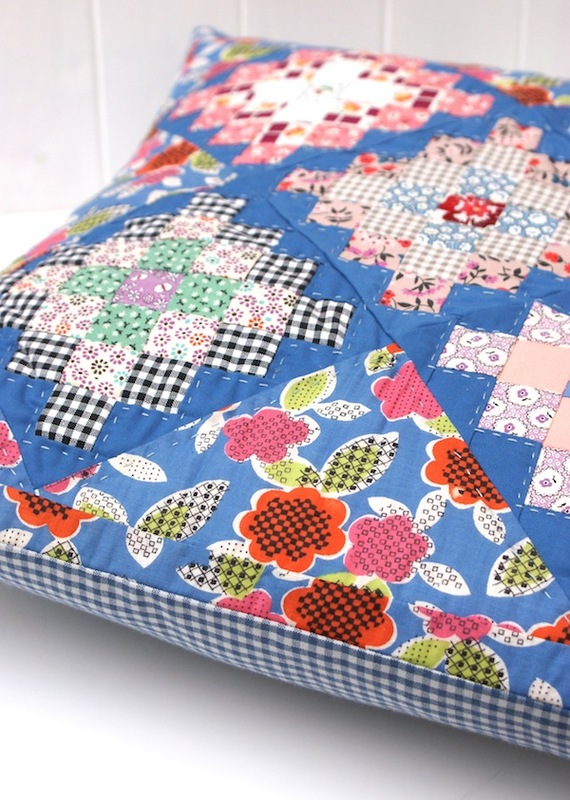 I'll be showing you how to set any size block on point with the quilty maths. 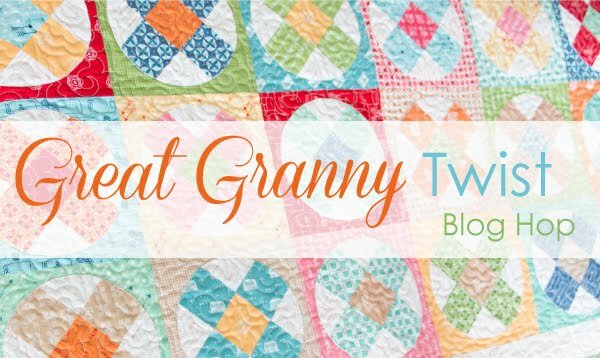 This is part of the Great Granny Twist Blog Hop, where bloggers have been invited to put a spin on a project from Lori Holts book. 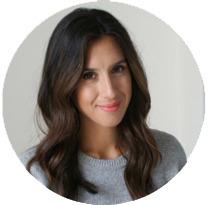 You can read all the details on the rest of the blog tour with Fat Quarter Shop here and find out what the rest of the bloggers have come up with. Such a fun idea, thanks FQS! As well Kimberly, from FQS has put together this video tutorial of her twist on the Granny Square block using appliqué circles. I pulled some crazy bright fabrics from my stash for this special project! The blue floral print used in the triangles is a vintage fabric I've been hoarding for *just* the right moment and I think it makes for quite a striking finish! I had lots of fun choosing the fabrics for the blocks for an eclectic mix of modern and old - I even fussy-cut the centre block with some vintage stichery taken from an embroidered tablecloth. 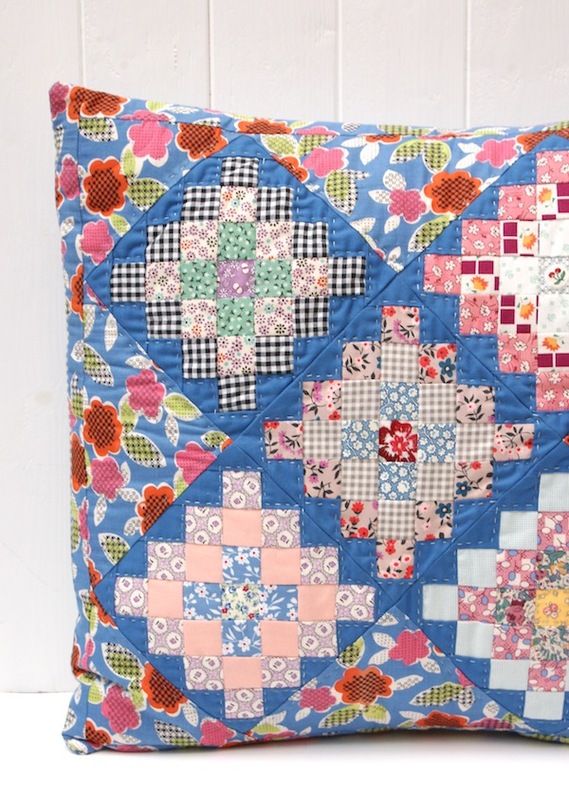 I hand-quilted using Aurifil 40WT thread using the Fat Quarter Shop Finishing Set. It worked a treat! I'm so pleased I took the time to hand-quilt. First, make up 5 Great Granny Mini blocks, according to Lori's instructions featured in the book. Once you have your finished 6-1/2" blocks we need the following calculations to determine what size to cut our pieces. Adjust the finished block size to make any quilt block on point. 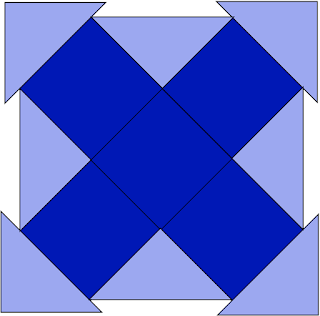 Cut square diagonally to make 2 finished (Half Square) corner setting triangles. 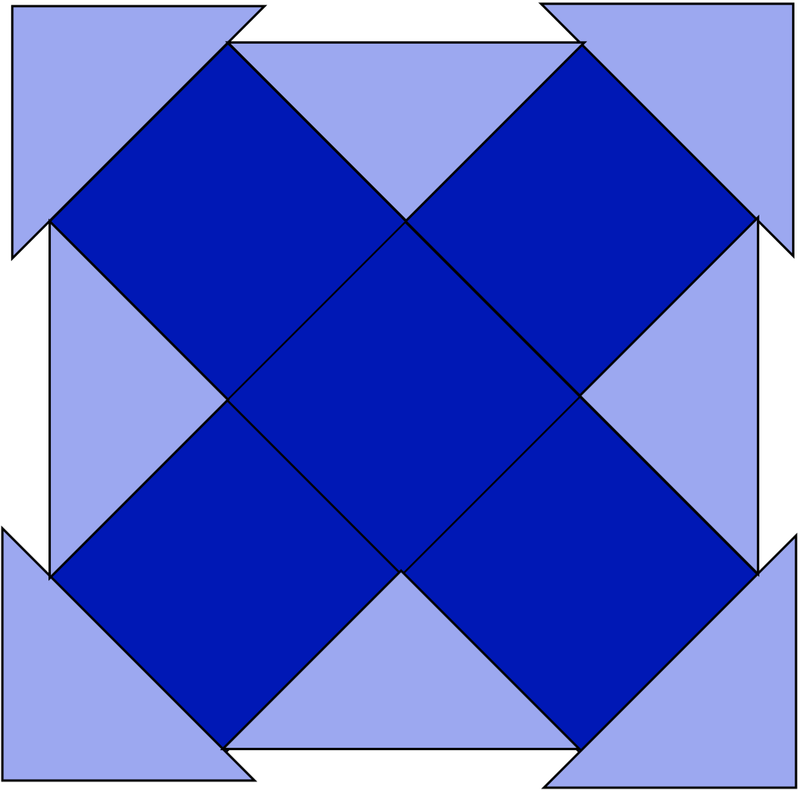 Cut square diagonally twice, to make 4 finished (Quarter Square) side setting triangles. Assemble your pillow top as follows. (Navy squares are your finished Granny Square blocks.) 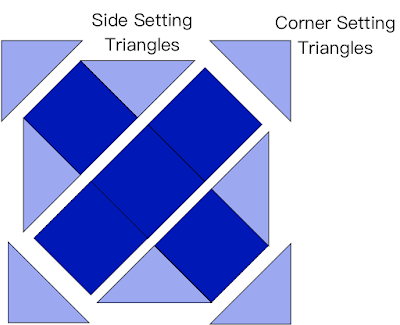 Piece together in rows, then add the corner setting triangles to the each corner. These measurements finish slightly oversized triangles so you have lots of wiggle room to square up your quilt top. I have a tutorial from a few years ago on how to finish your pillow with an envelope closure. Granny Square 'mini' block by Lori Holt, adapted with permission by Jessie Fincham. You can purchase the book from Fat Quarter Shop here, and if you're in the UK you can purchase the book from me at Sew and Quilt. Love your pillow and the 'twist' you've made. The blue solid is perfect, too. Do you know which fabric it is? That is a very sweet pillow! Thank you so much for sharing your instructions on it! Your fabrics are fantastic too! Pretty pillow! I love your choice of fabrics. Your pillow is fabulous! I love the block set on point! Your pillow is stunning! I love the colours, especially that beautiful deep blue...and I love the blocks set on point...perfect! 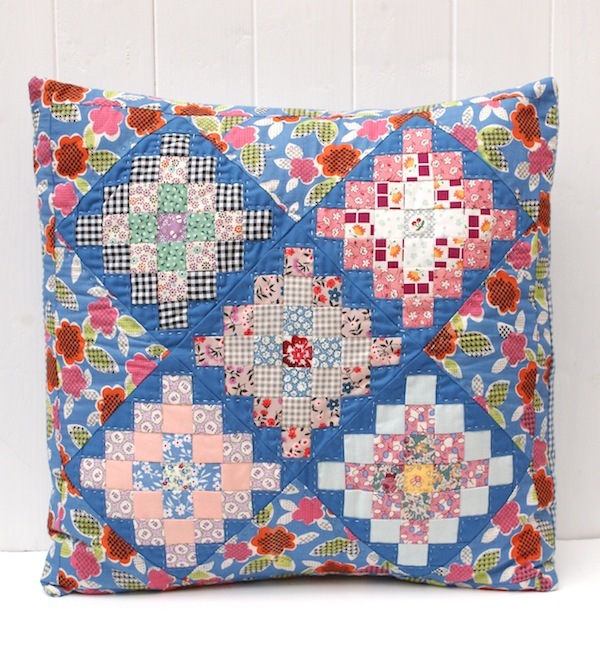 Thanks for the tutorial...I love the texture that the hand quilting gives your fab cushion. NEAT PILLOW! THANK YOU FOR SHARING! what a clever idea. this is definitely at the top of my list. wouldn't it be adorable in valentine colors???? very natural and good looking colors. 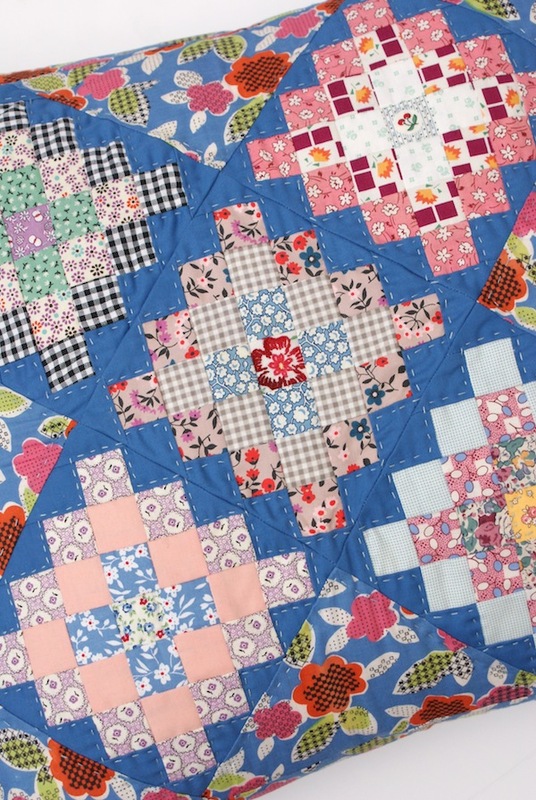 One of the delights of learning how to quilt is finding such a wealth of patchwork quilts patterns like yours from which to choose ones quilt design.